Let’s start with what doesn’t work. 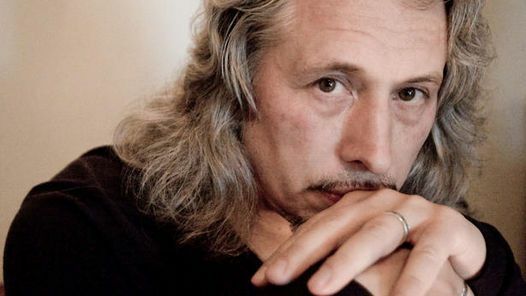 Modern Russia’s Vladimir Sorokin has crafted a short spin through a future dystopia set in the year 2028. He wrote it in 2006. Suspension of disbelief is thus thrown out the window from the start. Twenty-two years are considered enough time to get back to the Russia of Ivan the Terrible, where modern technology mixes seamlessly with a divine monarchy and Medieval styles of corporeal punishment. That would be more believable with an appropriately large cataclysm at its heels (Germany after WWI went pretty insane, for example) but the text doesn’t seem to provide that. It doesn’t work but is it supposed to? 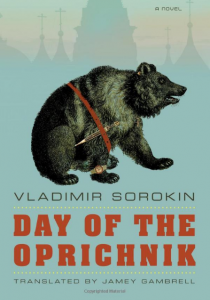 The culture barrier between an American reader and a Russian writer doubtless interferes in my understanding of Day of the Oprichnik. It’s a work of speculative fiction which seems to combine all of the worst elements of the Russian state in a soup of depravity without aiming for realism at all, so where the dustjacket got its “too disturbing to contemplate and too realistic to dismiss” I don’t know. Like I said, possibly the culture barrier keeps me in the dark. However, all of that’s okay. Ignore it and you’ll find that this is really more of a talented guy’s eager emulation of William S. Burroughs. Maybe he hasn’t read Burroughs, I don’t know, but the parallels are pretty strong. It’s not a rip off or a rehash, though it does contain futuristic drugs, X rated homosexual encounters with glowing enhancements and plenty of blackly satiric scenes of unbothered carnage. Sorokin skips town on the Burroughs technique, possessed of his own clean prose style ably translated by Jamey Gambrell in 2011. The majority of people in this country will not be interested in reading this book at all since it is deliberately repugnant, has no plot and isn’t even satirizing the United States like American Psycho and its ilk. It wasn’t my sort of thing either, mainly due to the strong content feeling gratuitous, a lot of it there just to court controversy. The aspect of this short tome I most solidly enjoyed was the character portrait of the narrator, Andrei Danilovich Komiaga. His Majesty’s father, the late Nikolai Platonovich, had a good idea: liquidate all the foreign supermarkets and replace them with Russian kiosks. And put two types of each thing in every kiosk, so the people have a choice. A wise decision, profound. Because our God-bearing people should choose from two things, not from three or thirty-three. Choosing one of two creates spiritual calm, people are imbued with certainty in the future, superfluous fuss and bother is avoided, and consequently – everyone is satisfied. And when a people such as ours is satisfied, great deeds may be accomplished. Everything about the kiosks is fine, there’s only one thing I can’t wrap my head around. Why is it that all the goods are in pairs, like the beasts on Noah’s Ark, but there’s only one kind of cheese, Russian? My logic is helpless here. Well, this sort of thing isn’t for us to decide, but for His Majesty. From the Kremlin His Majesty sees the people better, they’re more visible. All of us down below crawl about like lice, hustling and bustling; we don’t recognize the true path. But His Majesty sees everything, hears everything. He knows who needs what. That’s Komiaga, one of the senior guards and the Oprichnik of the title. Pious, patriotic, in love with Russia. Swears, smokes, sleeps with whosoever he pleases, does drugs, rapes, pillages, tortures and murders in the name of the state and then lectures his fellows “…we’re guards. We have to keep our minds cold and our hearts pure.” The thing is, Komiaga is not a classic unreliable narrator – his assignments are open-shut cases, the “subversives” he takes out are actually at odds with the state, the draconian tactics he utilizes are carried out as a job and a message to Russia’s enemies. He’s not especially paranoid. He’s simple-minded, decadent and devoted to the cause, that’s all there is to him and that’s precisely what makes him such an interesting narrator. Being satire, Day of the Oprichnik has no other even partially developed characters. The others are all samples – of corruption in work ethics/politics or of deviancy in some form. And to my frustration the political elements were not the main focus of this future song – rather, perversity takes center stage and is the main flavouring agent of almost every chapter. Everyone has their own level of tolerance for systemic evildoing and bad behavior. Some will be repulsed/disturbed. I was often bored. It felt like a cheap hook – if the reader’s attention wanders with all the economic shoptalk, there’s a dirty ballad coming up to regain interest. Of these mini-scenes, only a few add much to the overall world-painting, leaving the rest to take away power from the larger set-pieces. Nor, frankly, is the equating of corruption in the halls of power with aberrant sexuality a novel concept in this day and age. It’s been done and done again. Unfortunately, in a book drifting through a day in the life of an elite policeman of a China-fuelled future (clocking in at less than 200 pages), nothing gets a lot of time on the spot, so that the interesting and annoying are in equal balance and the characters are never fleshed out to a reasonable degree – making this little more than a tour, swift yet leisurely, through the decadent goings-on of a Burroughsian sci-fi future. Verdict: It feels like he was trying to make his point through obfuscatory slang and perversity, which is fine, that’s his choice as an author. I didn’t care for the result and would have preferred a wider view on the future world’s economic and political support system. Then I might have found it a fascinating work of speculative fiction. As is, I label it a curio. If you worship Burroughs or dystopic fiction, or if you want to be well-versed on the modern Russian literary scene, go right ahead. I move on to other things.